It is a canton of the Province of Santa Elena, Ecuador. Its cantonal head is the city of La libertad. The city is the economic center of the province and one of the main ones of the country. The Canton La Libertad is connected to the cantons of Salinas and Santa Elena by a road network of good condition in dry and rainy seasons. This canton has a sandy surface that is not very flat and rough in its proximity by cliffs that are not conducive to bathers at high tide. This beautiful county of the Province of Santa Elena, has an interesting tradition in relation to its name. Its territory is located in a place of true privilege in the Bay of Santa Elena, adjacent to a picturesque group formed by rocks and geographically called "Caleta" in which a colorful geometric arch has formed naturally. Its formation dates from prehistoric times. It has approximately 80 species of plants typical of the arid zones of the Ecuadorian coast such as: pechiche, ceibo, guayacán, cedar, palo maría, jigua, matapalo, nettle, among others. There are many of the emblematic coastal bird species of the country, such as: pikemen, pelicans, terns and petrels. The sea of ​​lace is an important refuge for 16 species of marine mammals, including two species of sea lions, seven species of whales (where the humpback whale stands out) and seven species of dolphins. There are also opossums, various types of lizards, iguanas, snakes and toads. Fish Ceviches .- is a delicious dish that is prepared with fish cut into squares, season, add lemon juice, onion cut into very thin slices and cilantro. It can be accompanied with husked corn, potatoes and sweet potatoes. Arroz marinero.- is one of the dishes most desired by tourists for its variety of seafood such as: squid, clams, crabs, snails, mussels, shells, etc. Roasted fish.- This fish is cleaned inside without removing the scales; marinate with lemon juice, salt and pepper; it is roasted like meat, first where it is open and then turns on the side of the scales and bathes with beer. It is called Nuestra Señora del Carmen and San Benito Church because it has as patrons the Virgen del Carmen and San Benito that every first fortnight of July, the residents of the parish pay homage to their patrons. This church was built in the year of 1981 with the management of the Parroco Marcelo Prandi with the collaboration of the community. It is located in the area called May 28 on 17th Street between 14th and 15th avenues. July 11 is the day in which a tribute is paid to San Benito, who was born and raised in the old town of Sabino in Murcia in 480, this region located in Italy is the one that Santos has given to the Catholic Church. • July 16 is the day that celebrates the feast of the Virgen del Carmen who in addition to being the patron of the parish is patron saint of sailors, in the Middle Ages it was believed that Mary meant "star of the sea". The name of "Stella Maris" has been given to all the centers of apostolate of the Sea of ​​the Catholic Church that are located in the ports. The festivities begin from July 3 to July 16, a day in which a fair tribute is paid with a serenade, recreational games, a typical food festival, a solemn Mass that is performed by the Archbishop of the province of Guayas. The Leon House Museum was built in 1991 on the initiative of the Ecuadorian plastic artist Leon Ricauter, his goal was to build a house where he could exhibit his chosen works of art and show pieces through their practical uses throughout his life, in this museum we are going to find art objects and everyday use of the different historical stages of Ecuador: pre-Hispanic, colonial and contemporary. We also find utilitarian objects from different Ecuadorian cultures such as Valdivia, Machalilla, Chorrera, among others. The Casa León Museum was built in 1.991. Av. October 9 between 13th and 14th streets, diagonal to the Civic Plazoleta. Casaleón is not a conventional museum, it is the León dream embodied in its own home, where the past and the present are interwoven, letting Valdivia's ancestral figurines share a space next to the works of art of distinguished contemporary Ecuadorian artists. • Archaeological samples found: In August of 1999, while the foundations of what would be an art gallery were excavated, a set of archaeological remains was discovered by chance. The inhabitants of this culture had almond shaped mouths, aquiline nose and used nose rings. They practiced occipital cranial deformation, also used a headdress like a turban. They buried their dead inside the same houses. They chewed coca and used tattoos. Its most characteristic ceramic is a plate of 5 or more curved feet, ending in a tip, decorated with human figures. Men are represented standing and women knee. • The museum exhibits the best works of León Ricaurte and their different pictorial styles developed over time, the same ones that are found in their own work shop. • The Museum has a cafeteria service where you can enjoy our snacks, specialties in seafood and other dishes prepared at home, served in front of the sea, accompanied by a good wine and a cozy atmosphere. • Services: Offers lodging services, cafeteria and archaeological museum "IN SITU" and permanent exhibition of Modern Art. The Malecón not only has a large turnout throughout the day, because at night the influx of tourists and peninsulares is intense. That has generated that qualifies it as the first night spa in the country. On the beach of the city, it is now common to see the presence of tourists enjoying this great work. It has 2 kilometers, of which 400 meters are regenerated. It is located a few minutes from the center of freedom. It has a dry climate, with an average temperature of 24ºC. • The children's area offers the children of our region a moment of distraction. During the day and night, the presence of infants is constant. • Enjoy the sea of ​​La Libertad is different, because the breakwaters generate a natural pool that is ideal for bathers and especially for children. • Fun: It has several family recreation sites, where we can enjoy the sun and sand games, recreational games for children and adults. • Surroundings: Regenerated streets, beautiful flowers, businesses arranged at the foot of the boardwalk, the Church well preserved, good lighting, stairways beaten by the sea, children's games and above all, a lot of cleanliness. • There are international food and other typical dishes. La Libertad is considered the place with the cheapest food in the province. 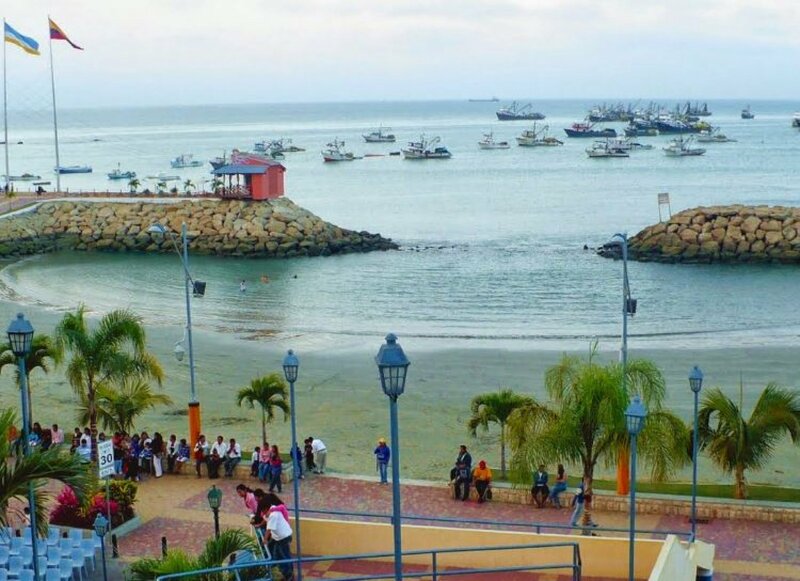 • Mirador de la Caleta: It is an ideal place that contemplates beauty from this sector you can see the splendor of La Playa del Malecón de La Libertad, you can contemplate how ships enter and leave this port and play with the swing of the wind and the waves of the sea.